This book was created by IBJ in 1996 as a reference tool. 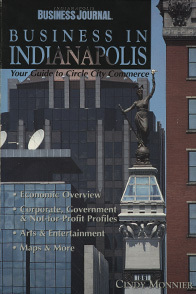 It is useful to people in all areas of economic endeavor, ranging from those who are looking for an overview of the kinds of companies and organizations that have developed in the Indianapolis area to those who are seeking detailed information about an organization’s management, products, services or employees. It provides an economic overview, corporate, government and not-for-profit profiles, arts & entertainment information, maps and more.